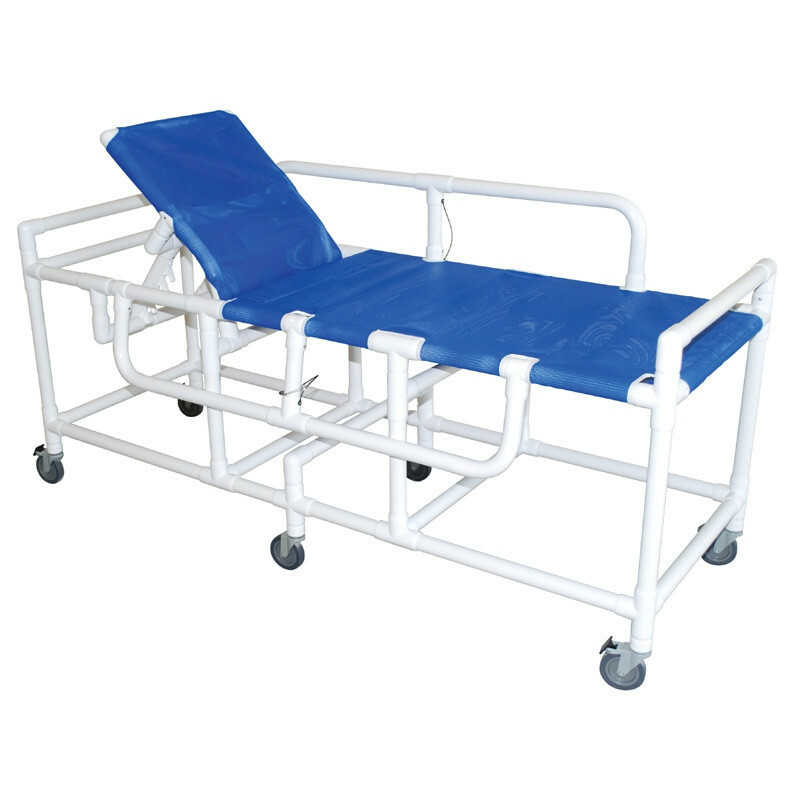 Hospital Gurney, Buy Hospital Stretcher, Patient Stretcher, 910-HS, 920. When you are bedridden, nothing compares to being clean after a nice shower. With the PVC Gurney, that no longer has to be a rare feeling. This healthcare grade bed is constructed of PVC, making it mildew resistant, as is the mesh sling and foam pad mattress. Underneath the mattress, there is a hard shell drain pan to prevent spills and messes, making the water drain for proper disposal. It is incredibly easy to clean; simply wipe down with disinfecting wipes, such as the Clean E-ze Disinfectant Wipes, so it is fresh each time you use it. In addition, it has been reinforced in stress areas, making it a more comfortable experience all around. It adjusts into five different settings to enhance that comfort to the next level. The elevating headrest ensures that comfort. Not only is it convenient and comfortable, but it is also incredibly safe to use. It has safety rails that lower for easy transferring, then raise and lock in place with user friendly pins. The PVC prevents any sharp edges and is completely lead free and latex free.